The concept of Accelerated Mobile Page (AMP), an open source initiative, was introduced in 2015 with the intention to take the mobile users’ experience of up to the next level. AMP is a stripped-down HTML format that loads much faster delivering the significant advantage of retaining and engaging the users. Using AMPs helps the target audience consume the content easily and faster. The existence of more than 25M domains in AMP format certifies the benefits of engaging users by creating quality AMPs. SEO masters favor the creation of AMPs to grab the readers and to encourage them explore the business website after going through the article, news, video etc published in AMP format. Some web masters create two separate versions of web pages and linking them by using popular ‘call to act’ buttons like – read more or click here. It allows the websites to pop up in AMP-only search results and to get more traffic. In some cases, the content of non-AMP and AMP is found different and the users didn’t get that they needed or expected; the fact has been noticed by Google. To resolve this issue, Google is introducing its new AMP policy on Feb 1, 2018. The policy makes it mandatory to have AMP content comparable to original web page content. If the AMP is not found containing similar critical content as on the original web page, web master will get a notification through search console; hence, update your content by then. AMPs designed with static content perform better in AMP search results. Use of built-in validator by extending the page URL with suffix of #development=1 helps the page rank better. Google’s structured data testing tool helps to fetch the specific URL with code snippet. AMP-ad or AMP-embed component of AMP framework allows implementing the ads in any format. AMP-analytics give you fair idea about the areas to make improvements. Although AMP is not a ranking signal; yet the creation of relevant AMP boosts the SEO results by engaging and encouraging more mobile users to visit the business website. AMP rolling out expands the landscapes of content creation, distribution and advertising; be the first to drive before your competitors. 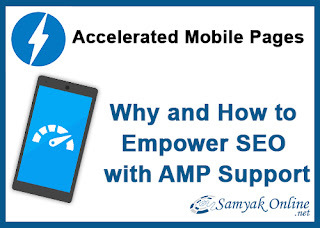 Samyak Online is a leading SEO Company to develop your company AMP websites by taking care of all Google’s new AMP guidelines. I myself have experienced the boost in traffic, stay period and conversion rate after creating Accelerated Mobile Pages (AMPs). A study by SEO PowerSuite in 2016 confirmed that only 23% websites were having AMPs while 29% were planning to implement AMP within 6 months; it means benefits have been experienced already. As there is direct relation between conversion rate and page loading time, so, AMP is a necessity for every size business. I'm new in this filled But your blog help me to learn SEO things thanks for sharing.